Mangrove marina has 102 wet slips for live aboard or transient boaters. If you’re looking for a wet slip, you’ve come to the right place: our marina has 102 wet slips for live aboard and transient boaters. Our wet slips can accommodate boats up to 70 feet in length with 24-foot beam, and 5 feet of draft. Our wet slips don’t just keep you tied to the dock, we also want you to enjoy your surroundings at Mangrove Marina, after all we’ve made them just for you. Spend your evening grilling out at one of our BBQ pits and Tiki huts, take a dip in the waterfront freshwater pool, or just relax and watch the sunset over the bay. 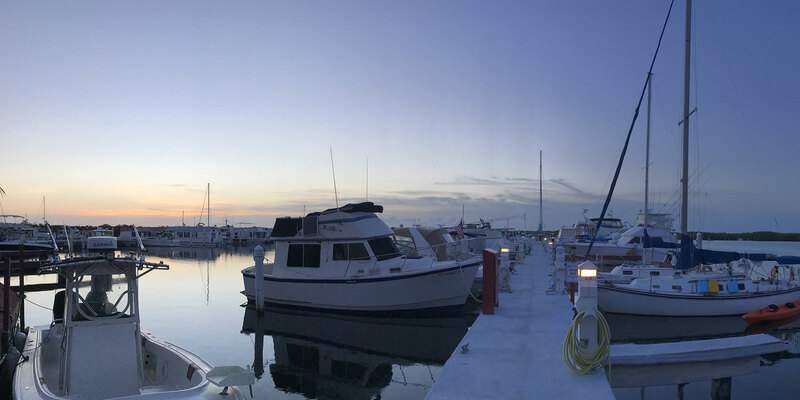 Mangrove Marina is spread over twenty acres, offering two bathhouses with showers, a complete laundry facility, wheel barrows, bicycle racks, and gardens for our guests. Our anchorage is a natural “hurricane hole” surrounded by hearty mangroves protecting our boats during storms. We allow boaters to stay in slips during storms but also provide dry storage services with our travel lift and 26K LBS fork-lift in our storage yard. Please call for wet slip availability and rates.